Iraq gains new ballistic missiles called “Scuds”—very powerful and expensive missiles that can reach from Iraqi land all the way to Tehran. When the sirens go on, it takes just three minutes before the missiles make landing, which does not give people much time to hide. Marjane’s father says it is useless to try to hide in the shelter in the basement. The damage done by the missiles is so great that the basement wouldn’t actually offer any protection to the family. They would just be crushed. “For the first time, I realized just how much danger we were in,” Marjane narrates. The danger to Marjane’s family only increases as the war gets more and more heated and Iraq gets more powerful weapons. Marjane’s father’s admission that there remains little one can do to protect oneself from the new missiles deals a blow to Marjane’s confidence and feeling of safety: she is not protected by her family’s wealth or her education. She is at the total mercy of the war. Many people leave the city because of the ballistic missiles, but Marjane’s family stays, because her parents believe that her education at her school remains her only link to a good future. Without it, even after the war with Iraq ends, they think that Marjane’s options might be very limited. One day, as Marjane goes shopping with a friend and is about to pay for new jeans and earrings, they hear a bomb explode. It turns out to have exploded in the neighborhood of Tavanir, the neighborhood in which Marjane’s home stands. Marjane’s family continues to try to preserve the prospects of her daughter’s life, even if in the short term it endangers her life. They want Marjane to continue as close to a Western education as possible, preparing her to thrive for a time when the war is over and perhaps a different government runs Iran. However, as the missile in her neighborhood shows, there is no escaping the war, and no guarantee that they will live to see the future they hope for. This represents one of the few moments when it seems that Marjane might lose members of her nuclear family to the conflict that has ravaged Iran for the past few years. Chance, however, has left Marjane’s family alive and taken the life of a different family. That Marjane’s friend died during a religious war because she was piously observing her religious faith is a fundamental irony. For Marjane, the death of her friend makes the war something personal and inescapable – her overwhelming grief and anger scours away any last remaining vestiges of her romanticism about the war. Goldman, Ben. "Persepolis The Shabbat." LitCharts. LitCharts LLC, 26 Aug 2015. Web. 19 Apr 2019. Goldman, Ben. "Persepolis The Shabbat." LitCharts LLC, August 26, 2015. 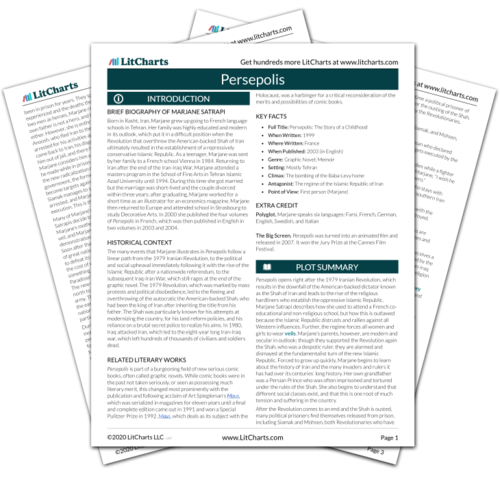 Retrieved April 19, 2019. https://www.litcharts.com/lit/persepolis/the-shabbat.